The decrease in the federal budget deficit has been touted as an accomplishment by many—most recently by President Obama during his State of the Union Address—but America’s debt situation is far from resolved. The deficit for the 2014 calendar year fell to its lowest level since 2007 due to a $2 billion surplus in December, according to a Department of Treasury report published on January 13th. The government ended 2014 with a total calendar year deficit of $488 billion, $300 billion higher than its 2007 deficit. 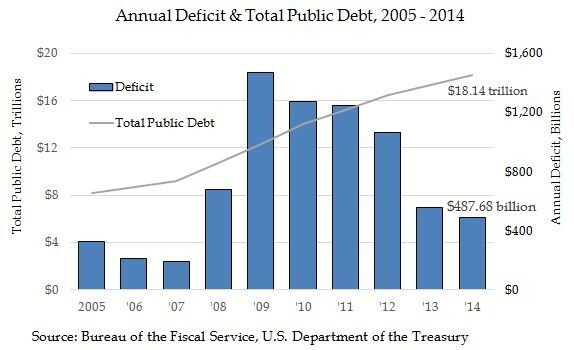 While the deficit for 2014 was reduced from its high of $1.5 trillion in 2009, total public debt outstanding increased by almost $800 billion to $18.1 trillion at the end of December, about double of what it was in December 2007. Debt held by the public was just over $13 trillion, over 75 percent of GDP. The deficit will continue to shrink through the end of 2015, but the Congressional Budget Office projects it will grow again in 2016 to reach $960 billion by 2024. There is no shortage of examples of how the government wastes tax dollars, such as $125,000 spent on a lavish, invite-only Fourth of July party at the Canadian Embassy, $600,000 on Labor Department propaganda posters, and $5.7 million on climate change games, to name just a few. Though the government has certainly been frivolous with taxpayer dollars, these comical expenses are not the main drivers of government spending. Spending on discretionary government services most people deem to be essential—roads, schools, defense, national parks, research funding, veterans’ benefits—are not the main problem either. 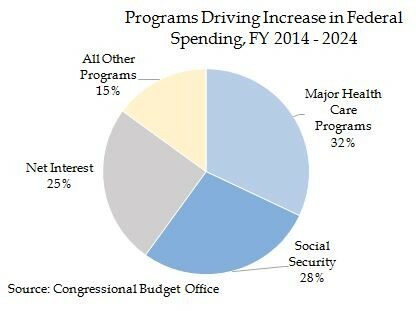 Almost two-thirds of additional spending will be driven by entitlements, primarily Social Security, Medicaid, and Medicare. America’s aging population is the primary contributor to the growth of Social Security and Medicare, while the Affordable Care Act substantially expanded the scope of Medicaid. 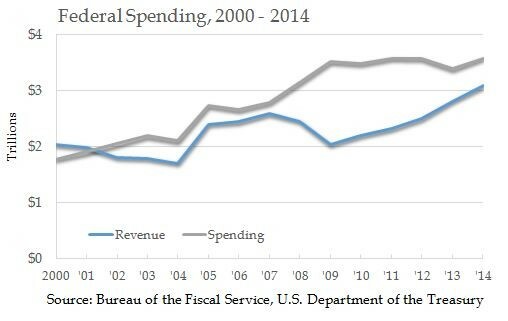 Adding interest payments to the budget brings the total increase in the debt from mandatory spending to 85 percent. Spending is projected to grow by $2.3 trillion annually by 2024. These numbers show that, even though it will be difficult, Congress should prioritize entitlement reform to reduce government spending. However, there is much low-hanging fruit to cut in terms of government waste. To start, government agencies can eliminate or reconfigure programs that perform similar functions to other programs. The Government Accountability Office identifies several areas of duplicative, overlapping, or fragmented spending every year, and its recommendations can easily be adopted by Congress or executive agencies. These reforms have the potential to save the government $100 billion or more annually. Wrongful payments made by the government through programs such as Medicaid and food stamps totaled $106 billion FY 2013. While not all of these costs are overpayments, reducing the mismanagement of funds would save the countless man-hours it takes to reclaim or refund inappropriate expenses. The funding of ridiculous studies, including over $53,000 spent by the National Institutes of Health to study sighs, and the millions spent by the Department of Veterans Affairs on extravagant artwork purchases during “use it or lose it season” reflects a system of perverse incentives that rewards bureaucrats for wasting taxpayer dollars. Adopting budgetary reforms, such as rewarding agency employees for cutting costs rather than spending every last penny in their budgets, would go a long way towards encouraging government agencies to save federal funds. Above all else, the government needs to tame the out-of-control growth in entitlements. Not only are these programs responsible for the majority of government spending, but some, including Social Security Disability Insurance, are scheduled to go bankrupt within a decade. President Obama said during his State of the Union that “It's now up to us to choose who we want to be over the next fifteen years, and for decades to come.” Entitlements need to be reformed and strengthened to both preserve them and put them on a fiscally sustainable trajectory for the coming decades. Though entitlement reform will be difficult, the 114th Congress and President Obama should treat it as a priority over the next two years. This op-ed was originally published in e21, Economic Policies for the 21st Century, on January 22, 2015.